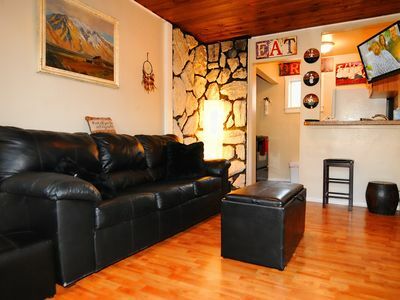 This is a brand new vacation rental for me. Come and discover this great place. WARNING this is an older building without modern sound dampening technology. Be a good neighbor. Quiet hours begin at 10:30pm. Please enjoy the peace and tranquility. 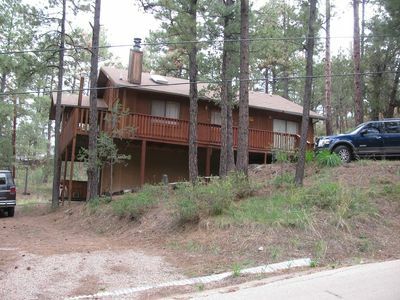 This is a classic Mid-town building that has survived the years right in the heart of Mid-town Ruidoso! Don't choose this if you want to be alone in the middle of the woods. 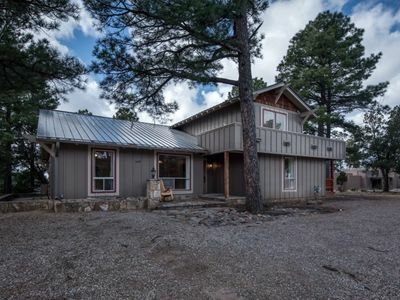 Choose this cabin if you want the ultimate in convenience to all the shops, bars and restaurants of Mid-town Ruidoso while being able to go out your back door and play in the river and enjoy the fascinating parade of wildlife going by. I have added an evaporative cooler for your summer comfort. The nights are still nice and cool in Ruidoso. You probably won't need it. If you open the windows at night and put the fan in the window it will be nice and cool in the morning. Just shut the windows after you get up and keep that cool air inside, then repeat the process at sundown! THE BUILDING: I have tried to determine when this cabin was built, but have not yet been successful. I have seen pictures of Ruidoso taken in the 1950s and it was there then! It was originally built as a hotel with 8 small shotgun style rooms. The bedroom was on the river side and the bathrooms were all on the street side. 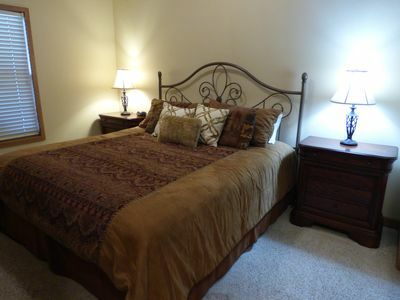 Sometime after that it was remodeled into 4 one bedroom apartments. That’s the configuration it was in when I bought it in 2007. To be truthful, it was in really rough shape then. It has suffered years of neglect. After a $100k remodel it is now a really cool and wonderful place. 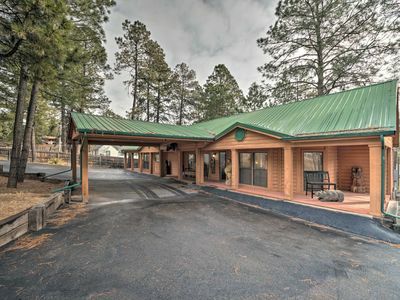 When you drive up to this building, you can imagine how Ruidoso was in the ‘50s and ‘60s when it became known as “The Playground of the Southwest”. If these walls could talk, oh, the stories they could tell. Check out the cabin next door. It was built in the late 1800s. That’s a wild thought. When you enter the condo, the living room and the kitchen greet you with lovely colors and a décor that is warm and comfortable. There is a nice comfy leather couch that is a sleeper sofa. You can put 4 people in this unit, but you may find it a little cramped. It is only 475 sqft total. All these finishing’s were completed in 2012. 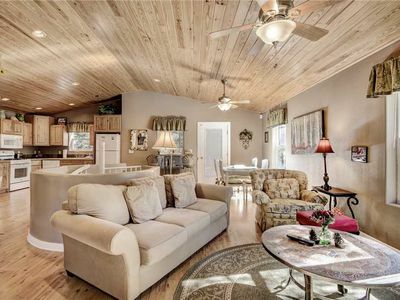 The floor in the living area is wood and the kitchen is tile. The other side of the condo contains the bedroom and bathroom. The bed is a lovely queen and really comfy! The floor in the bedroom is a lovely hardwood. In the bathroom it is tile. 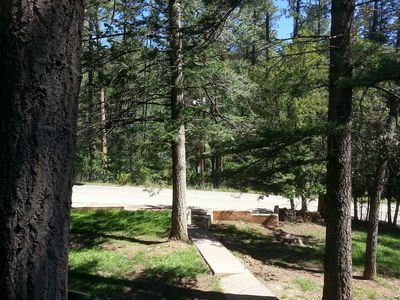 When bedtime comes, open the window and let the sound of the Rio Ruidoso lull you to sleep. THE PARKING: Parking in midtown can be a challenge on busy weekends and holidays. We have private parking for our building. I will put a parking pass in the form of a postcard in the cabin for you. With that you can park one vehicle in front. 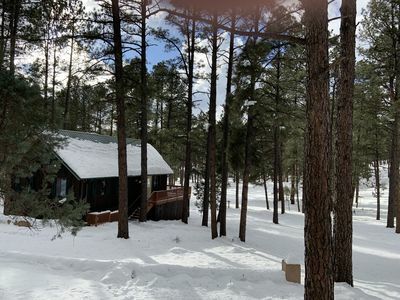 If for some reason you have more than one vehicle or if friends come over, there is a public parking lot just on the other side of the log cabin on the west side. MID-TOWN: This is where the action is. Restaurants, bars, shops, it is all within a short walk of your front door. No DUI’s while staying here. You can Rock and Roll at Quarters or Country and Western dance at WPS (Win Place or Show). You can close the place down and walk home. 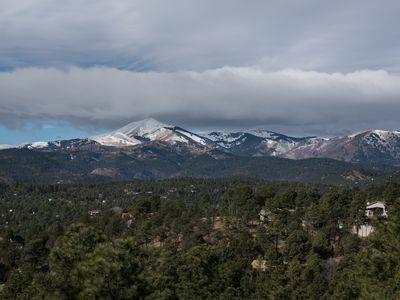 If late night is not your thing, you have a choice of five of the best restaurants in Ruidoso within a two block walk. If you don’t like to go to restaurants, you have some of the most amazing clothes shops within two blocks. If you don’t like any of the above, then there’s always wine and desert! Yes within one block there is an amazing cupcake shop and a lovely selection of wine to taste and take home. I can go into more detail later! THE RIVERSIDE: Every coin has two sides and this is no exception. You have all the fun and excitement of Mid-town just steps away, and all the peace and quiet of nature right off the porch. We have a lovely porch with a great view of the river so you can relax while enjoying the wonderful climate. 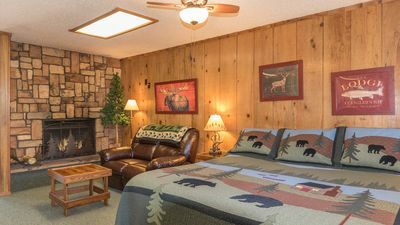 It really is the perfect place to relax after a hard day of hiking, skiing, riding, or shopping. 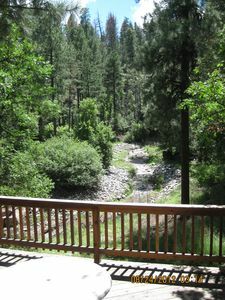 We certainly hope that you will choose our little RELAXIN’ ON THE RIVER Condo when you plan your vacation to Ruidoso. We have done what we can to make it a wonderful experience for you. Thanks again. We hope to see you soon. 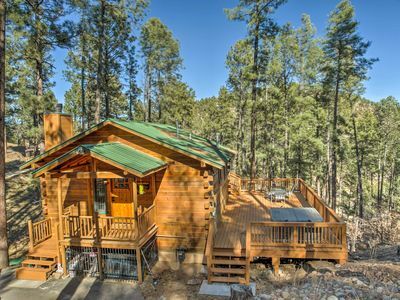 Treetop Hideaway - Beautiful retreat w/ 3 decks, hot tub & peaceful ambiance! 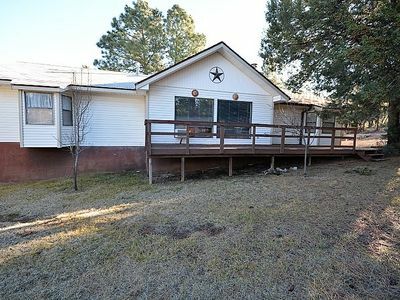 Right on the Famous Ruidoso River!!! 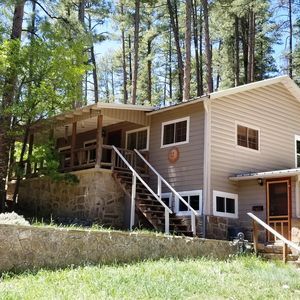 Pine Squirrel: Cute 1 bedroom in the Upper Canyon! 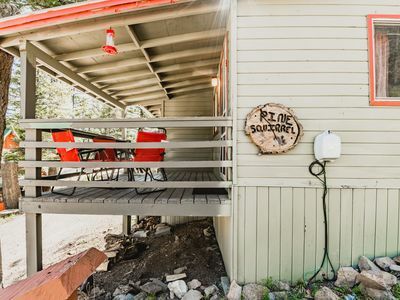 RnR Rustic Retreat Free Secure WiFi, Hot tub, Very Clean, Peaceful, Location! 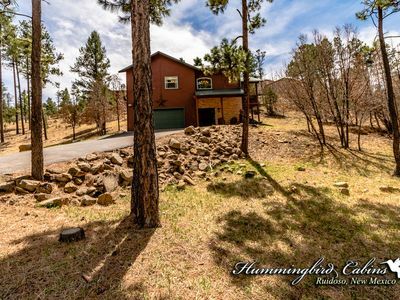 Secluded ‘The Lincoln Cabin’ w/Hot Tub & 3 Decks! Fly Like an Eagle at the Eagle's Nest! 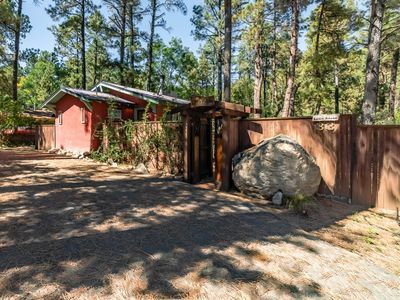 Enjoy this cabin in the woods, located close to midtown shopping and the casino. 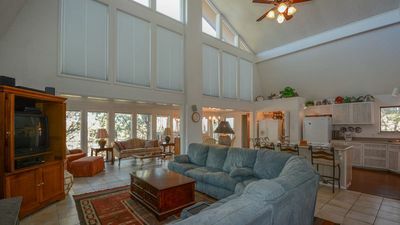 White Mountain Vacation: 'Perfect getaway location' With hot tub. NEW! 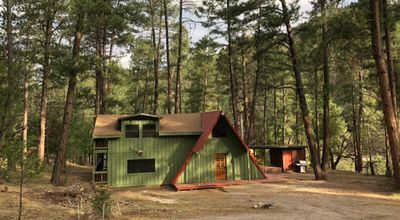 Unique Ruidoso Family Retreat in the Pines! Step into the charming world of “Little Adobe”'! Private outdoor hot tub! 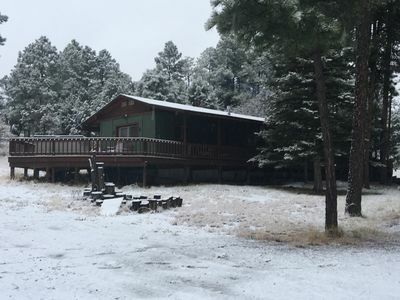 Pet Friendly Cabin with a great location and easy access to Everything Ruidoso! 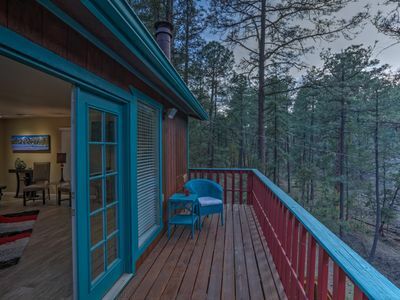 Relax and Unwind On The Huge Decks Under The Pine Trees!